Now, I’ll be the first to admit that I’m easily distracted and a little bit absent-minded. My PC at work is full of abandoned to-do lists and plans that sort of diverged somehow and I’ve lost count of the cups of tea that I’ve abandoned because I want to check out this site, fix this bit of painting or read this next chapter. So, don’t be surprised in a few months if, instead of the list I’m going to post below, I’ve painted, I don’t know, two dreadnoughts and (horror of horrors) a pack of Thunderwolf Cavalry. What I am going to talk about is what I need to think about doing next with my Space Wolves, or more particularly, what models do I really want to paint rather than the poor Blood Claw standing on my painting tray at present. It’s a long term plan as I’m not a fast modeller or painter! In my “to paint” pile at the moment are four Fenrisian Wolves, seven and three quarter Blood Claws, a Wolf Guard Terminator and a Land Speeder. I also have a box of Scouts to build which can wait for a bit. I bought them at Christmas when a store in my parents’ area was getting rid of its stock. However I received a box of Scouts with sniper rifles as a gift from my boyfriend a day later which I built first (they have cloaks and things and looked pretty cool). Obviously, I want to make inroads into this list before I buy anything else. The troops are the highest priority as I’m desperately short of them. I’ve played three games with the guys that I have painted, and every time I’ve needed more troops rather than the elites and HQs that I’ve painted. I’m thinking of mixing the other things in though, to stop myself getting too bogged down, starting with the wolves. However, I’m tempted to pick up a few more things to build to give me a bit of a change from painting. Partly because I want to finish off the trilogy and partly because even I know that they’re a good unit, I’ve been thinking of getting Long Fangs for a while. Now, I’m quite keen on the dramatics of my army (yeah, I know, fluffier than a fluffy kitten that’s sitting on a feather filled fake fur cushion), so I want to build Long Fangs that make me think of ancient warriors, wise beyond measure, battered by a thousand wars on countless worlds. This got me thinking, why would a Space Wolf become a Long Fang. As a group they are pretty bloodthirsty, and I imagine it might take quite a lot of effort/persuasion to make a son of Russ stand back and shoot at things from a distance. My main thoughts on this can be summed up as “attrition”. A Long Fang is a rare thing, most of his brothers would have died in battle as Blood Claws and Grey Hunters, the Company needs his unique experience and if he keeps charging in, bolter in one hand, chainsword in the other, there will be a day when they won’t be able to. He’ll also have seen brothers needlessly lost to things that a good missile would have sorted out, a sort of mental attrition that one day might lead to him swapping his bolter for that missile launcher. Finally there will be physical attrition, he might have lost an eye or a limb or two, or three. The Wolfblades are a unit from William King’s Space Wolves novels. Basically they are outcasts, either through disgrace or embarrassment, that are sent by the Chapter to be bodyguards to the Navis Nobilite family that provides their navigators. When I read the books they stood out as a fun unit to try to represent. I’d count them as Wolf Guard and paint one as a Grey Hunter, two as Blood Claws, one as a former Wolf Guard and the final guy as a Long Fang. I can’t give the Long Fang a heavy weapon, so I’ll just have to be creative. The other five Tac Marine figures will get used as Grey Hunters I guess. I’ve mentioned before that I want a strong raider feel to my army, which I’m going to create hopefully using bikes and Land Speeders. How many and who leads them hasn’t been thought through yet. I should probably get a Rune Priest but I don’t know whether sticking him on a bike would be a good idea or not! Anyway, as you can see, I have a lot planned. Of course, planning is the easy part, doing is the difficult part and I may play a couple more games and realise that I need to go in another direction entirely! I really should get back to painting my Blood Claws I guess. I’ve been reading a lot lately. I got interrupted partway through False Gods by the arrival of Salamander by Nick Kyme, but I’ve finished both of them and Galaxy in Flames and I’m pretty happy. I’m now reading Flight of the Eisenstein, which I loved first time round. I actually got quite a bit of painting done this weekend, I managed to scrape together enough time for a day off after all and I finished one Blood Claw off and made a start on the next. However, they can wait for a bit, as I’m going to talk about books today. Firstly, it’s Black Library’s 15th Birthday and they’re releasing one E-book short story a day to celebrate, which would be nice if I had an E-reader or any computer sized between my laptop and my phone, neither of which are comfortable to read on for long. I’m just hoping that they bring out a paperback version or something. Anyway, Salamander… If you recall, when I wrote about Hell Night by Nick Kyme a while back I mentioned that the story seemed rushed, this is not the case in Salamander. I actually really enjoyed it, and it makes Hell Night make more sense, particularly regarding the relationships between Dak’ir and Tsu’gan and Pyriel, and the sinister Iagon who gets mentioned in Hell Night but not expanded upon at all. Dak’ir is thoroughly likeable and oddly enough, so is Tsu’gan once you get to know him, apart from being insanely jealous/ snobby. The story itself is a good read once it gets going, although it does get a bit overwhelmed by all the different enemies in the last part! Still, I need to pick up the next book the next time that I order stuff from Amazon. I have plenty to read in the meantime though. It’s really good re-reading the Horus Heresy books as not only do I know more about what is to come from the later books, I know more about 40K lore now, so things that I missed the first time round now mean much more. Erebus, however, is still a complete and utter… well, he’s the big villain of the series I guess. I just hope that, in the great traditions of fantasy fiction, he gets totally and utterly and dramatically squished in the last book. Unfortunately, this is the start of the Grim Dark 40K universe, so I imagine that he’ll wriggle out of it somehow. …Lucius and Jokaero and Waagh! Brought new paints out, you see! So, the new paints are out and I guess that I’m quite excited. On one hand I have to learn the new names, but on the other there seem to be some useful new things to try out. I’m glad that there’s going to be a Foundation white, well, it’s called “Base” now, but I’ve wanted one since I first found out about Foundation paints. I find that certain colours, particularly yellows and to a lesser extent, reds don’t paint particularly well over a black undercoat, I hope that Ceramite White will make painting that little bit easier. Another paint that I’ll be buying on my next trip to Games Workshop will be the Imperial Primer. Now, I don’t have any outdoor space at all, so any undercoating that I do has to be done next to an open window. This limits when I can spray and how many coats are easily doable. I’ve also had trouble with the primer bubbling on my models. My Wolf Lord has some areas that had to be filed down and smoothed over with liquid greenstuff after the primer seemed to eat away at the model. A brush on primer might save a coat of spray primer, even if, I imagine, the coat isn’t as smooth as it would be otherwise. I’m also tempted by the Lahmian Medium, although I’m not sure when I’d use it yet. I saw something similar in the rather over-priced brush set that was on sale before Christmas, and was rather annoyed then that you couldn’t just buy it. It’s suggested as a way to make your own glazes, which in themselves look interesting. I guess that I can think about it. The glazes themselves are said to accentuate colours, which might be an interesting effect. I guess that if I get too curious I could experiment with them. The Citadel Texture paints are not so interesting for me, as I already have a vaguely satisfactory basing routine, but my boyfriend seems quite interested in them. Ah well, I guess that paints won’t break the bank. The downside to all of this is that I have to think what old paints I’ll have to stock up on. The paints are all still there, but I don’t want to buy a pot of Fenrisian Grey and find that it’s not the same as Space Wolves Grey. The only worrying thing for me so far is that The Fang is the new paint equivalent to both Shadow Grey and Fenris Grey (and I’ve just noticed that the new light blue-grey has a very similar name to the old dark blue-grey) and they are two quite different shades. I’ve picked up pots of Space Wolves Grey and Shadow Grey so that I have a stockpile, at least for a while and if I start getting low, I’ll have to try to use the old knitting trick of mixing the new in with the old gradually. For those who haven’t noticed yet, GW have provided a guide, which might come in handy. I’ve been doing a bit of painting this weekend and I’m currently in the middle of highlighting a Blood Claw. Unfortunately I’ve bodged it badly, so I’m going to have to fix it tomorrow. Still, it’s nice to feel like I’m making progress on this squad, as I want to get some more games in and I need to get some more troops ready first. I’m tired tonight, so I’m going to introduce my other HQ. Hildólfr Deathmask is my wolf priest and my first conversion. He has terminator armour, which brings him up to 120 pts, and, like my Wolf Lord will have extras added to him as I go up in points. As with my Wolf Lord, I guess I should add some fluff. Hildólfr adopted the name Deathmask after a Last Stand against heretics, that he miraculously survived. Unfortunately it left him terribly scarred (as these things do) despite spending almost three years in suspended animation. He initially turned down the opportunity to become a priest, saying that he missed the brotherhood of the pack during his recovery, but eventually he gave in. The time spent recovering led to him spending more time studying than is the norm for a Space Wolf and he uses what he’s learned to help his brethren, whether they are physically hurt or are troubled spiritually. 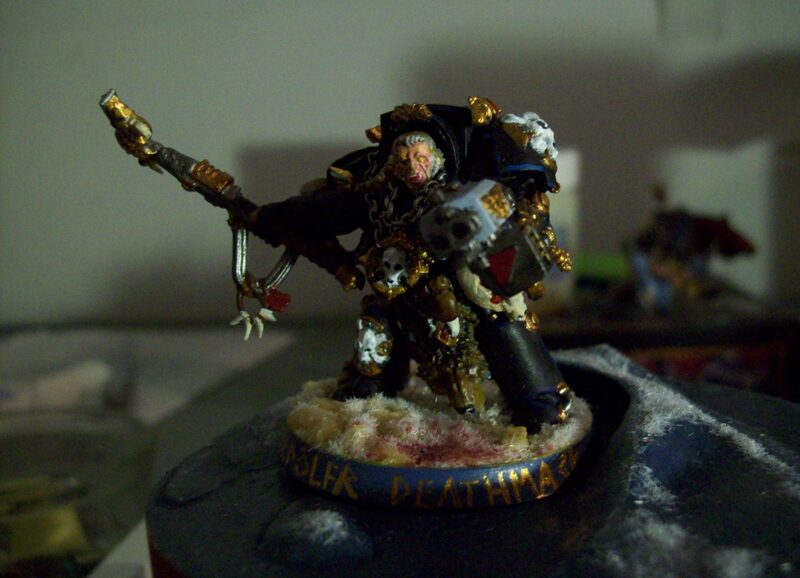 Modelling wise, he’s a Space Wolf Terminator with a Storm Bolter and Crozius Arcanum. The Crozius was made from a Thunder Hammer and a personal standard from the Space Wolves pack. The Wolf Amulet was made from a crux from the Space Wolves Terminator box and a length of chain from a cheap necklace that I hacked up. I used the same chain to make the webbing thingy and I made the pouch and bag from green stuff. The helmet was made from a wolf skull from the kit with green stuff added to bulk it out to about the right size for a helmet. I added a bit of blue (Vallejo Dark Prussia Blue) to the black paint I used to paint him so that I could use a black wash. I then used the same blue to highlight the armour. I’m not a hundred percent happy with this model, he was my first conversion and I’d do things differently now. I’m also not happy with how he plays at the moment, so I may make a different version later on with different armour, or I might just spend some time on him when I have some to spare. He’s not as effective an HQ as my Wolf Lord, he dies much more easily, but he does give the squad he’s with Fearless, which turned out very useful in the last game I played. I guess that’s it. I did some more painting this evening. I also read a chunk of False Gods although I’m finding it harder going than Horus Rising, partly because it really is grim and dark, especially as I know this time round what’s coming next. I’m getting quite tired at the moment, I need a day off and don’t have time for one, so I’m struggling to get much enthusiasm up to do anything and it’s beginning to impinge on my hobbying. I’ll probably get something done this weekend, but I haven’t a clue what. I got a bit more done on a Blood Claw today, which was nice, and I’ll try to finish him this weekend but if I’m tired I may end up staring at him for ten minutes before returning to the sofa! 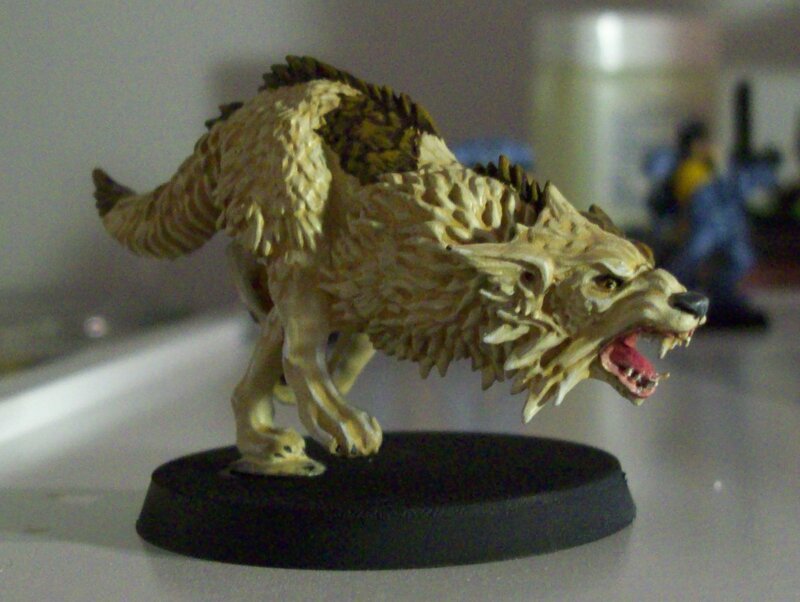 So, for part 3 of my Fenrisian Wolf extended review is on painting. I make no claims to be a good painter, I enjoy it and I work at it, but I’ve only been hobbying since last July so I’m still a newbie. Fenrisian Wolves, unlike my poor half-painted Blood Claws, are relatively straightforward to paint. They can be divided into four parts: undercoat, base coat, wash and layer and, unusually for me, I only used 10 paints, a spray and a wash on this, the first of the pack, and I think that I’ll use variations on these ten colours for the rest of the pack. So this is Tassen, which, you may notice, was painted with a certain childhood favourite in mind (which looks a bit macabre now that I look at him). I based him after I painted him and I’ll paint that to match the rest of my army when I have a batch of models ready. I started with a chaos black undercoat. I then painted the eyes and the inside of the mouth. Now, I don’t like the eyes in the example pictures on the box and in the March 2012 White Dwarf, so instead I painted them with a base coat of Iyanden Darksun, followed by a coat of Golden Yellow. I used Chaos Black for the pupil and I painted the lids with a blend of Chaos Black and Codex Grey. For the mouth I used first Mechrite Red for a base coat and then used different blends of Mechrite Red, Red Gore and Elf Flesh for the inside of the mouth. I then rimmed the mouth with the same blend of Chaos Black and Codex Grey as I used for round the eyes. I should apologise here. I normally use quantifiable blends, but when I’m painting small areas with a lot of similar shades, I tend to work by eye, so that I have a bit more of a colour gradient. I then moved onto the main body which I base coated with an approximately 5:1 mixture of Bleached Bone to Tausept Ochre. I actually started off with a mix that included Iyanden Darksun, but it was too yellow. I then washed the whole model with Gryphone Sepia. For the brown areas I used a 1:1 blend of Chaos Black and Scorched Brown. I then drybrushed the legs with Bleached Bone. Next I moved onto the highlights. On the light bits of fur I used Bleached Bone, while on the brown parts I used first Scorched Brown and then Snakebite Leather. On the legs I used Skull White. Finally I painted the teeth Bleached Bone, followed by a sepia wash and Skull White highlights. I’m quite happy with this model. It was quite straightforward to paint and looks quite nice with relatively little effort. I’d recommend painting them off the base though, as it makes it easier to get at the underneath. Finally I should apologise for the late post. I was at a work function yesterday. I may be a bit late with tomorrow’s post too, but that’s life I guess. I did less this weekend than I planned 40K-wise (I did make pork pies though). I’d planned to work on green-stuffing a project a bit and undercoating it, undercoating my wolves and painting at least one Blood Claw. Well I got part of it done, as the gash in my finger confirms. I’ve now green-stuffed my project so that there are no sharp edges and mostly basecoated it. My Fenrisian Wolves are also undercoated. All I’ve done with the Blood Claws though is paint some grey paint on the backs of the knees of one of them. What I did do is sort out my modelling things. I bought myself a plastic chest of drawers and I’ve put my tools and my bits box in there. 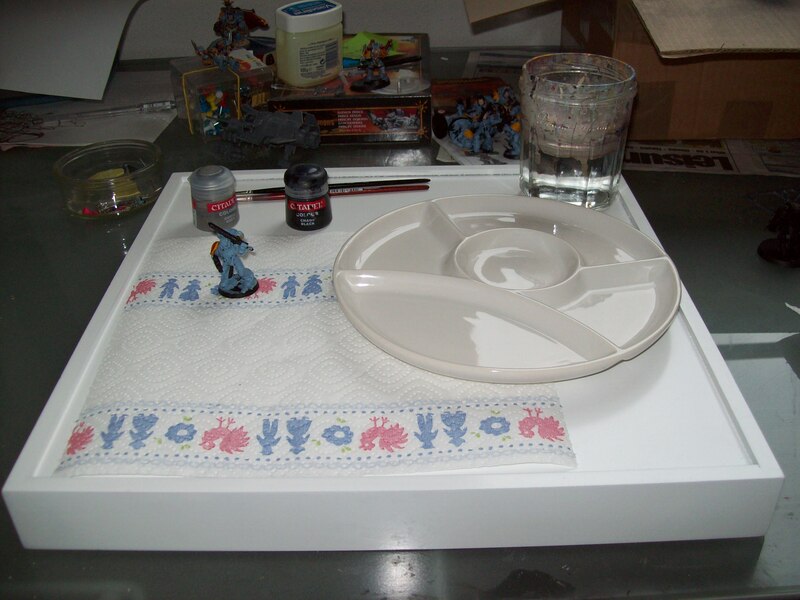 I’ve also tided up my painting area and I now have a paint station in the form of an upside down tea tray. Hopefully I’ll lose less brushes now. I’ve used it a bit and it seems quite handy (and there’s even a picture). What I have painted is the mouth and eyes of one of my Fenrisian Wolves, I know that I said that I wouldn’t until I’d finished my Blood Claws but I’m puzzling over getting the eyes right. I think I’ve got it, but I won’t know until I paint the rest. That’s probably a job for this week though. On one hand I now own Dawn of War, on the other hand I am never, ever, ever going to complain about Games Workshop staff ever again. I saw the game on display for €6 outside a shop the other day (I’m not going to say which shop for reasons that you’ll see below) and decided that it might be fun to buy it. I’m not a good gamer but for €6, I can’t really go wrong. The introduction of the game looks spectacular in that slightly cheesy over the top 40K way, I just have to get round to playing it. Now, I go to GW for stuff and I pick up paints from the local toyshop and I get treated like everybody else picking up 40K stuff, that is a person. I go to a bog standard chain electronics shop and first the shop assistant decides that I’m with the guy in front (er…no, last time I looked I didn’t have to be accompanied to go into a shop in the Netherlands and besides, my boyfriend is the guy checking out e-readers near the entrance) and then tells me that it’s not the sort of game that girls play. I tell him that I know what it’s about and that I play the game. He seems very surprised at that and says that girls don’t usually do that. Now, I work in a male dominated subject area and since I was a kid I’ve had rather unfeminine hobbies, I was an Air Cadet and a Young Engineer and I have a Foundation Radio license and I have never, ever had anyone be particularly sexist to me before. I know this probably sounds moany but it’s written several hours after the event, so my brain has compressed the whole thing down to: idiot in shop, unaccompanied female, not a girl’s game. It says something that I’m still upset about it almost a day later. Needless to say, I won’t be going back to there again. Well there’s the grumpy stuff out of the way, I’ll return with a happier post later. I actually got some stuff done this weekend (and a war wound).